The second half of the 1960s was a period of political thaw, a time of gradual liberalisation. The outward signs of this thaw could be seen in the speeches of some Communist politicians, but mostly in the media. This new spirit of reform was also felt in Czechoslovak Radio. 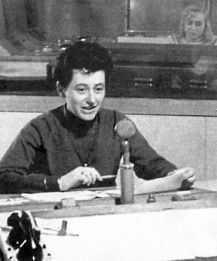 Journalist Olga Szantova "The atmosphere was definitely more relaxed", says political columnist Jiøí Hanák, who worked as a commentator for Radio Prague in the 1960s. "The change mainly affected the central programme department, where we were allowed to portray the situation in Czechoslovakia as it really was. This obviously had an affect on our foreign political comment." Olga Szantova, who worked in the American Section in the 1960s, has similar memories: "There was a certain degree of free- dom. This mainly affected the programmes about Czechoslovakia, the texts of which we were given by the central programme department to broadcast or send abroad. Russian Radio even refused to broadcast these programmes in 1968. We enjoyed our work. It was different, we started going out into the field more. But one thing I must emphasise is that the style of work didn't really change that much. All scripts had to be approved by the Head of Section, and then they were taken to the Chief Authority for Script Supervision (HSTD). They stamped them with the initials HSTD. It was ridiculous, actually, because some of the HSTD people couldn't even speak a foreign language. But without a stamp and the Head of Section's signature, the script couldn't be broadcast. And even then there was a strong sense of self-censorship at work. We knew very well what we could write, and what was unacceptable. During the Prague Spring the HSTD form of censorship was scrapped. But I didn't experience much of that - soon after '68 they threw me out." Tanks burning outside the Czechoslovak Radio building, August 1968 The "Prague Spring" came to an end in the early hours of August 21, 1968, with the invasion of Czechoslovakia by the armies of the Warsaw Pact. For former American Section journalist Cecile Køíová, it all began on the morning of the 21st: "I was one of the lucky few who had managed to get into the radio building that day. There were barricades on the streets, even some of the bridges were barricaded. I went into the studio and read the news of the violent occupation of Czechoslovakia by Warsaw Pact troops, who no-one had invited, and handed over the microphone to a colleague from the French Section. Suddenly the door to the studio flew open. In the doorway stood a soldier, his uniform covered in dust. He pointed a machine gun at me and said "Von!" - which means "Out!" in Russian. I said I was already on my way out, thank you. And there ended 19 years at Radio Prague. I'd just finished editing an interview with the American actress Shirley Temple. I'd recorded it the day before. It never went out. Soon afterwards I emigrated to the United States." 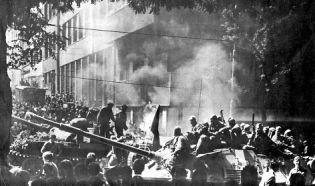 August 1968 was an almost identical repeat of May 1945. On the morning of August 21, the station broadcast a statement by the Central Committee of the Czechoslovak Communist Party, condemning the invasion of Czechoslovakia. Prague citizens began gathering in front of the radio building, and there were clashes which left several dead. The bullet-pocked facades of several surrounding buildings still serve as a reminder of those violent events. At 8am the building was occupied by Soviet soldiers. Normal studio broadcasts were suspended, but makeshift broadcasts continued from studios the Soviet soldiers hadn't managed to find. The next day Czechoslovak Radio - including Radio Prague - began broadcasting from another location in Prague. The broadcasts were restricted to 10-minute news programmes in Czech/Slovak, English, German, French and Spanish. These secret broadcasts lasted until September 9th, when Soviet troops left the main radio building and broadcasts could begin again from the regular studios.